Solomon Group hosts seminars, workshops and micro conferences to advance leadership principles. SG is creating a place where women and people of color can come together to talk about the world’s most complex problems and create actionable solutions. Inspiring, thought provoking discussions, two-way conversations that lead people to action that can make a difference right now. Solomon Group’s principal, Robert Johnson, refers to this learning as “empowerking.” Empowerking describes the actions of a leader that involves developing themselves as leaders and supporting the development of other individual leaders and the overall community at large. Look for Empowerking Talks to continue in the fall of 2014. SG’s Robert Johnson was selected from a nation-wide search to be featured in Discover Your Inner Strength. 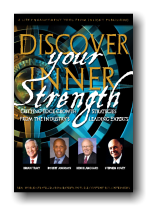 The book features best-selling authors Stephen R. Covey (Seven Habits of Highly Effective People), Brian Tracy (Million Dollar Habits), and Ken Blanchard (One Minute Manager). Collectively, these three authors have sold over 35 million books and tapes around the world.